We supply electric golf trolley spares to the public via our support and online sales shop. You can find many spares for different trolleys. 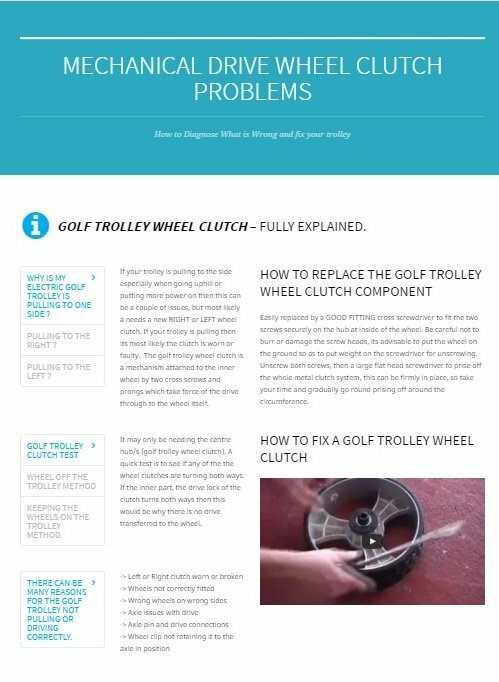 Having a problem with your trolley, don’t worry, we have a support page which can help determine what is wrong and what spare is needed. Then also is our support on how to remove and replace the faulty spare part. Which Electric Golf Trolley Spares do I Need ? 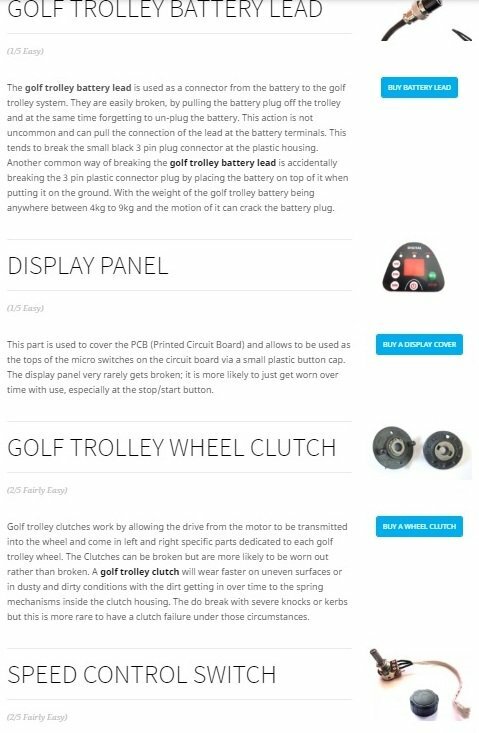 Our support page will describe the faults an electric golf trolley can have. It will also describe the spare parts needed for each fault. It is not a full proof method of determining the spare needed to be ordered, but gives a broad outline of the common problems that can occur. Described in detail we have a full description of golf trolley spares parts and there functions. This will allow the user to get more of an idea of how their own golf trolley works and what each spare looks like and its role in making the electric golf trolley work. Many of our spares are designed for fitting many makes of golf trolley. We supply precision spares to fit ProRider, Stowamatic, ProForce and many other makes and models. Our store shown below will describe the golf trolley spare part and explain whether it should fit the model or make you have. Customers are more than welcome to ask our professional opinions on fault or problems they have. We can use our experience of fitting and fixing over the 15 years to determine which electric golf trolley spares will suit and fix any problem you have been having. The battery charger CP1230 is a 12volt 3amp charger. The ones on the store are CP1230 with the 3 pin round socket as attachment. The (male) screw from the front wheel unscrewed itself whilst using the trolley (Prorider) on the course. The screw and fittings with the exception of the axle were lost’ Can you supply the missing items, Thanking you in anticipation. We have available online in the store the front wheel bolt system for the T-handle to ProRider golf trolley front wheel.